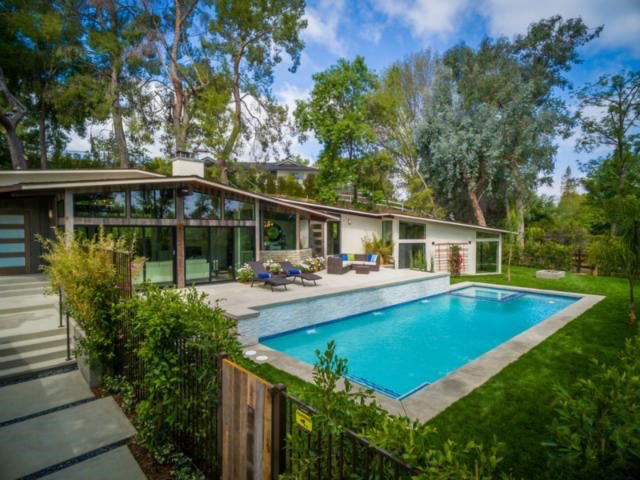 This stunning mid-century modern home gracefully fuses a modern and rustic aesthetic. Light spills in through clearstory windows and multi-slide doors that virtually eliminate walls. The result is indoor/outdoor living in the classic Southern California style. The entry flows to the sunken living room with a fireplace. A wood-fired pizza oven is highlighted in this Viking kitchen that seamlessly merges with the family room with 14ft ceilings, clearstory windows, a polished concrete floor and an entertainers bar. Kitchen pass-through windows open to an outdoor kitchen/dining area flanked by a fire pit and conversation bench. 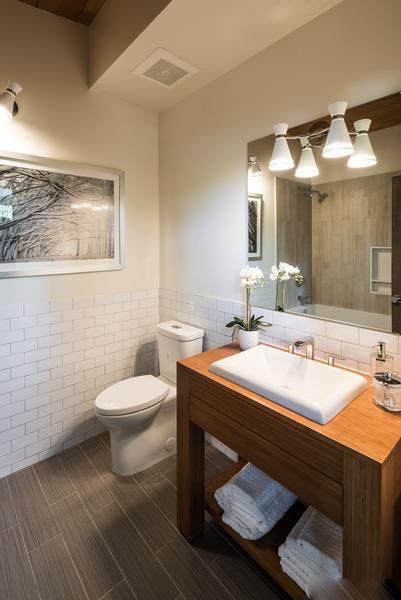 A master suite with a dazzling bath has a spacious shower, freestanding soaking tub, separate vanities, and private WC. The master bedroom has an open beamed ceiling, a contemporary fire feature, and large windows with direct access to a fire pit and the built in spa which connects to the glimmering pool. Three sheer descent waterfalls emerge from a white ledger-stone wall. A spacious detached garage has attributes of a mid century barn. On the opposite end of the property lies a separate entrance and parking area for guests, extra vehicles or an RV.